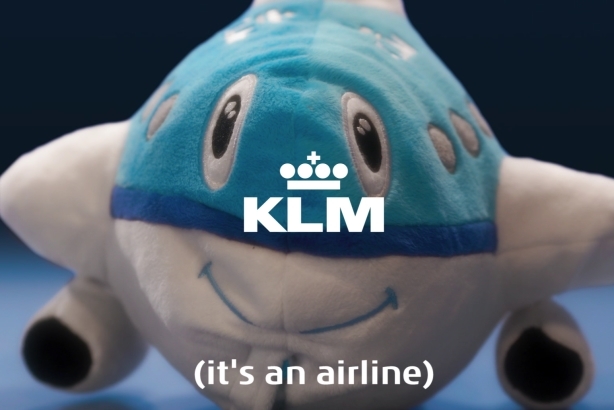 KLM is using humor to create an emotional connection to the brand and drive general awareness of it as an airline option in the U.S.
Air France-KLM conducted a brand study which found that many American consumers believe KLM to be either a radio station or brand of milk. So the company set out to let people in the U.S. know that it’s an airline. KLM is opening new flight routes from Miami and several cities on the West Coast. The airline already serves more than 50 North American cities. The overall strategy of the campaign was to use humor to introduce KLM across digital channels, which would help create an emotional connection to the brand and drive general awareness of KLM as an airline option in the U.S.
"In terms of demographics, we wanted to target people who travel to Europe, who have a passport, and have intention to travel to Europe or Asia for business or to visit friends or family," explained Christophe Attard, Air France KLM’s VP of marketing and communications, North America. The campaign team wanted to land a comedic spokesperson to help reinforce the humorous elements of the campaign and star in a series of digital short videos. Social media plays a big role in KLM's business, so the brand wanted the campaign activation to be primarily focused on digital content. KLM was the first airline to partner with Facebook Messenger to enable booking and servicing back in March. "For us, [social media] is not only a place to promote a brand," added Attard. "We want to answer every question within 60 minutes; we want to solve every issue within one day. We use social as a way to spread the news and connect with customers." KLM worked primarily with its in-house comms team to develop and execute the campaign, with Mustache helping to develop digital creative components and produce the videos for the campaign. Finn Partners assisted with the second wave of coverage that was generated by the campaign launch. The PR team set out to pitch the campaign launch to The Wall Street Journal or The New York Times, with hopes of having a story be picked up organically by other outlets from there. The campaign team approached the business section of The New York Times to offer the outlet an exclusive to write an advertising story on the campaign. This led to a feature piece. Through Facebook, Twitter, Instagram, and YouTube, KLM launched a paid ad component to the campaign featuring four videos starring comedic actor Ken Marino, known for his roles in Wet Hot American Summer and Childrens Hospital. Marino explains in the videos that KLM is an airline and answers such obvious questions as: "What’s a flight attendant?" and "What’s an airport?" KLM developed a microsite for the campaign, which features the videos and an interactive experience where visitors can play through simple picture hunt games that help explain the airline's in-flight features. By playing the games, customers can earn loyalty points with Flying Blue, Air France-KLM’s frequent flier program. KLM will continue to promote the campaign on digital channels through the end of September. The microsite will be live until November. KLM also has a pop-up event planned in San Francisco this fall. The campaign has generated coverage in news, leisure, and travel outlets, including: The New York Times, Tnooz, Travel + Leisure, TravelPulse, and PAX News. KLM’s It's An Airline campaign has garnered 120 million media impressions, measured across both social and traditional channels, not including a segment that aired on CNN International’s Quest Means Business. The campaign videos featuring Marino have garnered over 650,000 Facebook views and more than 200,000 YouTube views.